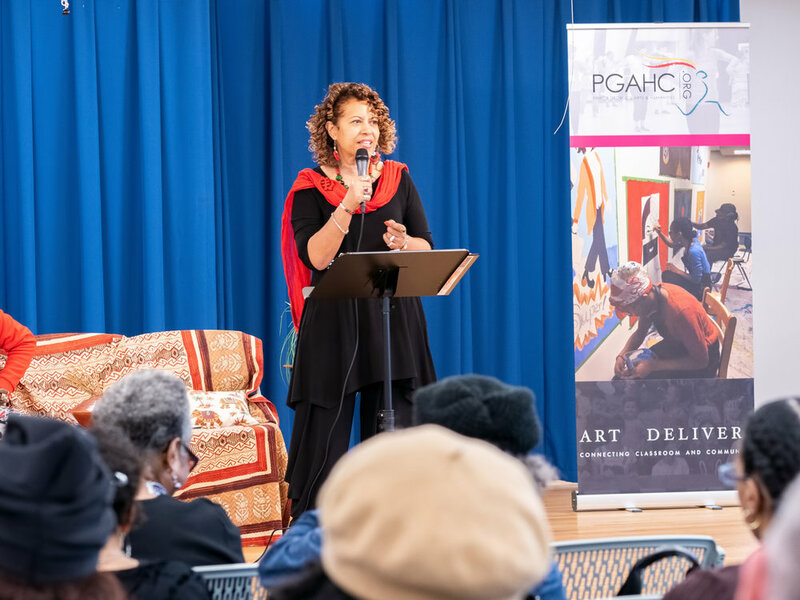 The mission of the Office of the Poet Laureate is to highlight literary arts and culture by promoting a countywide appreciation of poetry through engaging programs and services for county residents and youth, a vibrant and interactive series of community activities, and a focus on initiatives which support and sustain the cultural life of Prince George's county. J. Joy “Sistah Joy” Matthews Alford was appointed as the inaugural Poet Laureate of Prince George’s County, Maryland in September, 2018. She is an author, arts advocate, as well as the producer and host of award-winning poetry-based cable television show, Sojourn with Words. Sistah Joy also received the Poet Laureate Special Award (2002) for “her outstanding contributions to the art of poetry” in her native Washington, DC. She is an alum of the late Washington, DC Poet Laureate’s “Poets in Progress” series and also of the Mariposa Writers Retreat. In 1995 she founded the socially-conscious poetry ensemble, Collective Voices, which has performed nationally and internationally (London, England) and continues to perform in the U.S. primarily along the East coast. Sistah Joy is the author of three books, Lord I’m Dancin’ As Fast As I Can (2000); From Pain to Empowerment, The Fabric of My Being (2009); and This Garden Called Life (2011). She is also the Poet Laureate of Ebenezer A.M.E. Church in Fort Washington, Maryland where she has served as president of that church’s Poetry Ministry for the past 15 years. Her poetry efforts particularly include literacy, social justice, individual empowerment and support for underserved youth groups and women’s support organizations. She has been a co-director of M-NCPPC’s Teen Poetry Residency, Expressions, Talk Up/Not Down, since its inception in 2006. She is a Charter Board Member of C.A.A.P.A. (Coalition for African Americans in the Performing Arts, Inc.). Visit her website https://www.sistahjoy.com for more information and to view samples of her poetry.